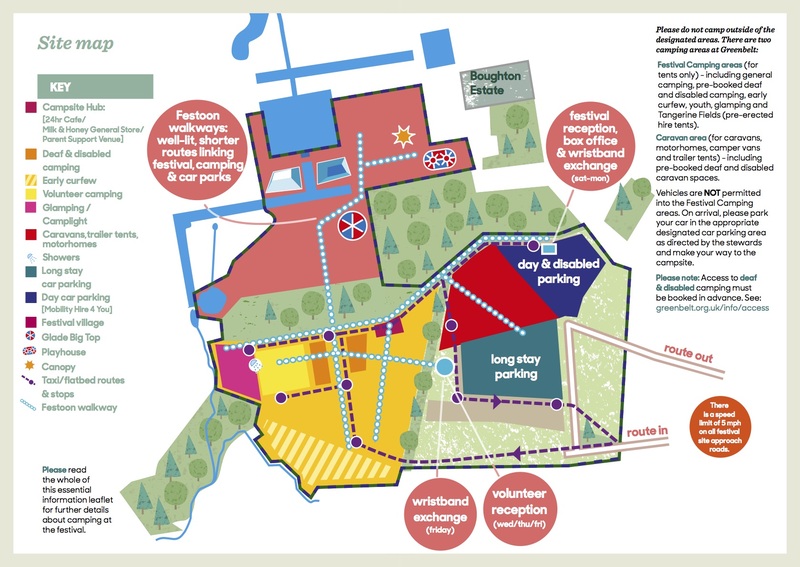 We work hard to ensure that disabled people – and their friends and families – are welcomed and included at Greenbelt. Up to 12 people including 1 disabled person. Up to 18 people including 2 disabled people. Up to 24 people including 3 disabled people. This site is a pre-booked section of the campsite (see below for how to book). The campsite will have accessible toilets and overnight charging facilities. If you’re planning to bring your caravan, campervan, motorhome or trailer tent, we have a designated area within the caravanning field to enable you to be as close to the Festival Village as possible. To camp in the Campervan Field, you need to book your space through the main Festival Box Office – before registering for your space in the disabled caravan area. Apart from positioning, the arrangements for the caravanning field apply to disabled and non-disabled festivalgoers alike. The disabled camping section of the site is a pre-booked* camping site. To book, you will need to fill out the Access Form (this will be available from this page nearer the festival). *Pre-booking does not guarantee you a space in disabled camping. But it helps us plan how much space we need to allow. We advise early arrival to ensure that you find the best space for you and your group. The campsites will have accessible toilets. Free charging facilities for scooters and wheelchairs will be available. We have two separate areas of disabled camping – one for wheeled vehicles such as caravans, motor homes and trailer tents, and a separate area for tents. There is no access by vehicle to the tented campsites. Car trailers will also need to be left in the car park and unloaded there. See below for information on support to get to your camping area. To camp in the Campervan Field, you must book your space through the main Festival Box Office HERE before registering for your space in the disabled caravan area. Because we are restricted to the area that wheeled vehicles can access, we need to follow a strict protocol of 1 pup tent OR 1 awning per unit. If you’re disabled – or recovering from an operation that will affect your mobility at the festival this year – and require an assistant to enable you to attend the festival, we’re happy to provide you with an extra ticket for them, free of charge. Personal Assistant tickets can be booked via our Box Office when you buy your tickets. We are delighted to be able to offer a Thursday afternoon arrival option for Access campers once more. This is for people who may need extra time to rest and acclimatise after travelling and setting up camp, before Greenbelt begins. NB: Only those who have pre-booked for a Thursday arrival will be allowed on site for security reasons. The Access Campsite Team will be available on Thursday between 3 pm and 6 pm, then on Friday between 10 am and 6 pm. There will be a taxi buggy and a flatbed truck available to help transport you and your kit from the car park to the tented campsite during these times. Please remember to ‘travel light’!!! The Access Campsite Team will be available on Monday between 3 pm and 6 pm, then on Tuesday morning from 9 am to 11 am. The site closes at 12 o’clock. The last run for the taxi buggy and flatbed truck will be at around 10 am. Disabled parking is available in the day parking car park next to the Festival Box Office. Taxi-buggies run from the Box Office down to the Festival Village entrance, via the mobility scooter hire location. If you need Disabled parking as a Day Visitor, or if you are staying for the weekend, you will need to fill out the access form (this will be available closer to the festival). To the right is our map from last year, this is unlikely to change for 2019 but please double check this page nearer the festival. 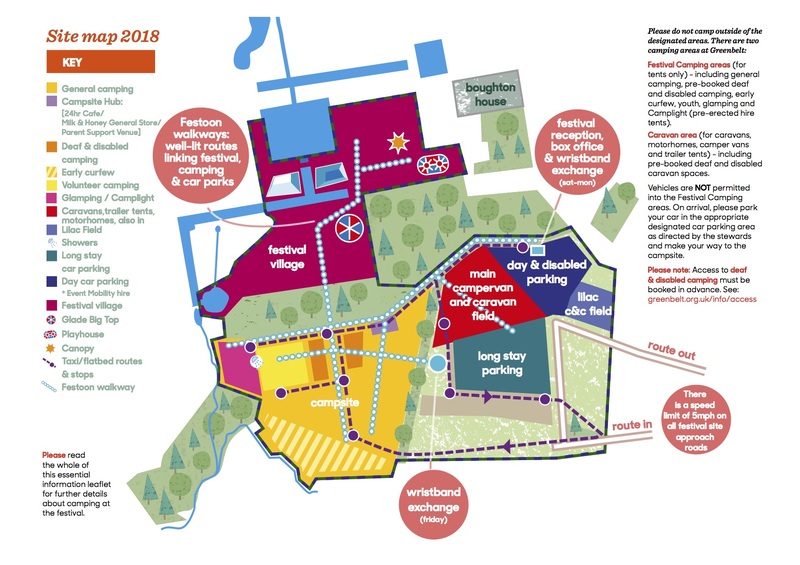 Event Mobility is delighted to be providing electric scooters and manual wheelchairs for the use of disabled, elderly and mobility impaired visitors at Greenbelt Festival. To reserve an electric scooter or manual wheelchair please book on line at www.eventmobility.org.uk, print out an advance booking form from the website or contact the office on 01386 725391 to request a form to be posted to you. Please be aware that advance bookings cannot be made by phone. If you’re visually impaired, you will need to fill out the access form (available from this page nearer the festival). This means we can include you on our list of those requiring Daily Diary information about this year’s festival in advance. We can send electronic versions of the Daily Diary in plain print to you shortly before the festival. This means you can change the font and the size of the information to your specifications, and print it for the festival, or download it to your own device. They will also be downloadable from the links on this page. Current links are from 2018. We can also print this onsite for you onto white paper (at a cost of £5). However, it’s a big document and you may find it easier to print it ahead of time and organise it to suit your needs. Please request this option on the Access Form. If you’re Deaf or hard of hearing, you will need to fill out the access form (available from this page nearer the festival). In partnership with Signs of God we provide a team of around ten top quality interpreters. Each interpreter has been professionally trained and most will be registered with NRCPD. You can be confident we will do our best to meet your communication support needs. We aim to have enough interpreters to give you choice to attend the events of your choice. Though many of our interpreters are full time professionals they give their time free of charge to give the deaf community full access to the Greenbelt programme. At Greenbelt we don’t believe that access is only about letting deaf people access hearing people’s contribution to the festival. We also encourage deaf artists and speakers to contribute to the programme. You can also expect some workshops and worship events in sign language. Previous speakers and contributors have included Clark Denmark on the importance of BSL recognition, Penny Beschizza on storytelling, Esther Maycock leading signed and cross-cultural worship, and Ian Stillman telling of his experiences in India. Having consulted with the festival’s insurers and St John’s Ambulance, we’ve decided that it’s not possible to safely and securely store medication at Greenbelt. This is not unusual for festivals of a similar size. We recommend that affected Greenbelters speak to their GPs or pharmacists for advice, or research alternative methods of keeping their medications cold and secure during the weekend. Can I have a power supply next to my tent on the campsite? Only car battery power supply is permitted (and the battery needs to be removed from the car first!). Will you have information for those with specific dietary requirements? Yes, to register for this information, you will need to apply via the Access Form (available on this page nearer to the festival). Camping is a bit difficult – do you know of any suitable local accommodation? There are a number of websites that can help you find suitably accessible accommodation. You might want to try Airbnb or Hotels.com. Alternatively, one of the best sources of reasonably-priced accessible rooms can be the ‘motel’ style chains: Travelodge, Holiday Inn, etc. Will you be producing information in Easy Read format this year? Yes, we will be updating our Easy Read information, please request this on the Access Form (available on this page nearer to the festival). Can I bring a generator to the campsite? For numerous safety reasons, petrol generators are not permitted onsite. You should only bring a generator if it is essential for medical/other special needs and arranged with the Fire Safety Team (firesafety@greenbelt.org.uk) prior to the festival. When you arrive, you must contact the Access Team on site, so they can ensure that you are appropriately sited, and the Fire Safety Team knows the location of the generator. Can I bring a Personal Assistant? When will the 2019 Site maps be available?